I Love a Good Icon! A few years ago, I spent one night in a lovely private home in western England that had converted an upstairs bedroom to a guestroom for a bed and breakfast. In the corner of their “lounge,” what we would call the family room, was a Dalek, which the gentleman of the house had won at an auction at the BBC. I was thrilled to be so close to a real Dalek for the first and probably last time in my life! For those of you who might not know what a Dalek is, let me explain: It’s the iconic metal alien enemy of “Dr. Who,” he being the hero of a TV show that has been around British culture for more than 50 years now. 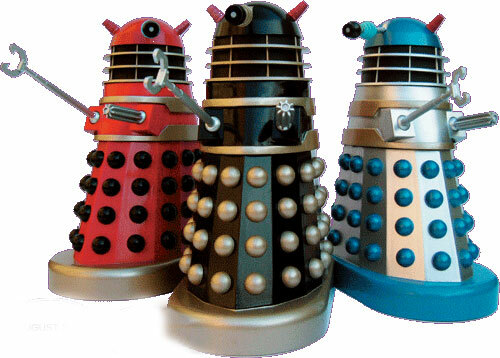 (See the picture of a grouping of Daleks.) The Daleks were introduced early on to the “Dr. Who” television series, when it was still in black and white in the early ‘60’s, and some say they are largely responsible for the sustainability of the show, because they became so iconic so fast, with their “Exterminate!” vocal threat being mimicked by children and adults alike all over the U.K. (and other parts of the world) to this day. Indeed, there is so much about the “Dr. Who” TV series that is iconic, where does one begin? The blue TARDIS police box space ship, bigger on the inside than it appears outwardly, the instantly recognizable articles of clothing that belong to whichever current Dr. Who is appearing on the airwaves: a ridiculously long knitted scarf, a fez, a long overcoat that flaps in the breeze, a leather jacket. All of these at various times have been insignias of the current Dr. which anyone in Britain could identify immediately, such was and is their popularity. The regeneration of the Dr.’s every few seasons – born out of necessity when the first Dr., William Hartnell, grew gravely ill – is a brilliant way to replace the actor without losing the character. He just changes shapes and faces but remains the same Dr. So he dresses differently, behaves just a bit differently from Dr. to Dr., but is essentially the same in moral fiber and character, and when this happens, the audience is drawn over and over again into the heart of an iconic character that has become part of British culture for the last half century. Everyone in the U.K. knows of Dr. Who. Even those who don’t watch the series know of him. They know what he’s about, what he stands for, a bit of his story and history. Like Beowulf and Chaucer’s venerable characters, he has been woven into the very fiber of a nation. That’s what an icon is all about. We all need icons of one sort or another in our lives, in the broadest sense of the word, something we can easily identify with that stirs our hearts upon instant sight. A Dalek, a TARDIS, a fez: all of these represent Dr. Who, and for the people who love the show and have been faithful watchers for years and even decades, when they see these objects, it brings a smile to their faces and often a tear to their eyes. Okay, I’ll admit it: I’m one of those “people.” I started watching the show when it returned from a 16-year hiatus in 2005, having first been shown in black and white in 1963. My first “Dr.” was Christopher Eccleston, with his leather jacket and street-smart charm. But I was completely won over when Eccleston regenerated into David Tennant, who has remained one of my favorite British actors even beyond his Dr. Who years. He of the long flapping overcoat and constant, wide-eyed overwhelming question, “What?” when something manages to shake him up. And then the deal was sealed when the youngest Dr. ever, Matt Smith, came along, bowtie and fez and all. Done and dusted. I’m a fan for life. Even though I was sad when Smith regenerated into the newest Dr. (still to be revealed when the next season starts up, but now we know to be played by British actor Peter Capaldi), I have pledged my troth to the show, and troth I will, if that means stick with it through future manifestations of change. If the TARDIS were to appear in my backyard and the door were to open beckoning me inside, I would become his latest companion and fly off with the current iteration of the Dr. without a moment’s hesitation. Because icons have such a strong power over us, when confronted with them, we cannot resist. Or at least, I cannot. So, how about you? What are the icons in your life that stretch your mind and tickle your heart? Come on, you know you have them. You just need to be willing to admit them, as silly as a fez or a Dalek as they might be. Or as serious. Icons come in all sizes and shapes, funny or serious. A bottle of Coca cola, a religious cross, a cowboy hat, a church spire, a Bible: all of these represent something larger than the thing itself, but the thing itself can often charge our emotions instantly and unwittingly. Look around you today and be aware of those iconic symbols that are a part of our everyday lives. Appreciate them for what they are: a kind of shorthand in our existence that stand for something that really moves us emotionally. Spend a day looking around for icons. You’ll be surprised just how many of them surround us. And then be sure to watch “Dr. Who” on BBC America when the series launches again, whenever that may be. You won’t regret it. Excited to know you are a Dr Who fan! For me it would be the iconic Barcelona Football (soccer) Club. Who although had a disappointing season riddled in scandals still draw me to their ideals for game. Their motto is “More than a club” and I hope they can realign to their original values for community and charity. Do you ever feel you were supposed to live in the UK!